Learn valuable tips for getting the most out of your training experience. Your bags are packed and you're ready to go-but are you ready to maximize your training experience? 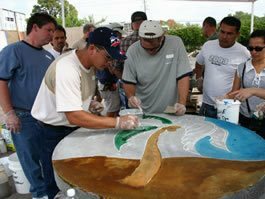 After all, you're taking the time and spending the money, so you'll want to get the most you can out of your decorative concrete training experience. Here's a "cheat sheet" of everything you need to do before, during and after training to get the most bang for your buck-learn it, live it, know it! Before You Attend TrainingYou've accomplished the first step by planning to attend training. According to Barbara Sargent of Kemiko Concrete Products, Leonard, Texas, "The decorative concrete industry is improving and progressing at such a fast pace that anyone who stays 'status quo' may be left behind." Tip #1: Sargent advises, "Do not let the cost of good training by true professionals hinder your decision to attend classes and workshops, because continuous education in all aspects of business will help keep applicators/artisans busy and profitable." Tip #2: Once you've narrowed down your course choices, Cindy Hamm of Decosup Dallas, Inc. suggests asking what the facility's position is on training. "Is the training a product promotional training lasting one or two days? Or is the training a hands-on application training that will allow you to work on individual projects lasting three to five days in length?" Hamm says. "Ask yourself if the course is what you're looking for," she adds. "The more applications that are being trained at one time is not always better, but time and quality spent on a couple of application methods will make you a more knowledgeable contractor, instead of a contractor that knows a little about a lot." 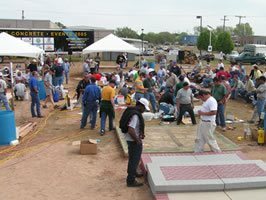 Tip #3: After you've registered for your decorative concrete training class, gather information prior to attending. 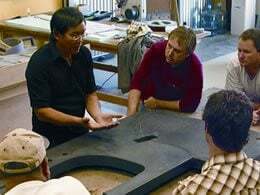 "Get your hands on training videos, books or guides, and check out Websites," says Ken L. Heitzmann of Decorative Concrete Systems. "This will help you understand what questions to ask and what to expect from the class." Bob Harris of the Decorative Concrete Institute, Douglasville, Georgia, echoes that sentiment. 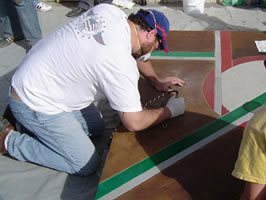 "Research a specific topic-if you've never stamped concrete before, research it online and talk to manufacturers," he says. "Have a basic understanding, so when you walk into class you won't waste time starting from ground zero. Also call the training company and ask for homework beforehand-ask them who you should talk to (manufacturers, suppliers, etc.)." Once you've narrowed down your course choices, Cindy Hamm of Decosup Dallas, Inc. suggests asking what the facility's position is on training. "Is the training a product promotional training lasting one or two days? Or is the training a hands-on application training that will allow you to work on individual projects lasting three to five days in length?" Hamm says. Photo Courtesy of Decorative Concrete Events. Tip #4: On the subject of homework, Lane Mangum of the Concrete Countertop Institute adds, "Get the syllabus ahead of time and write down questions-that way you can focus on discussion and not worry about remembering what you wanted to ask or getting your question answered." You can also jot down notes during lectures for the same effect. Doug Bannister of The Stamp Store says his ideal attendee is an experienced concrete contractor who also has some decorative experience because, he says, "the experienced people help reinforce and validate the quality of information and instruction", though he admits they have the occasional student with no experience. "They still find the training invaluable," explains Bannister. "When they come back for a second class, they say they learned so much more the second time because they now had a frame of reference. This type attendee benefits most when they have viewed training tapes and read books on the subjects. Familiarization helps." Tip #5: "We recommend dressing to participate in all applications," says Janine Flynn of Superstone. "From your shoes to your hat, you don't want to have to worry about getting dirty. We find that the more the contractors participate in the actual process of applying our flooring systems, the faster and easier it is for them to learn. You can't see how it feels to walk in wet concrete, broadcast color hardeners and release powders, or see how it feels to spread our overlay system-you have to get in it and on it with your hands and feet." "You can't see how it feels to walk in wet concrete, broadcast color hardeners and release powders, or see how it feels to spread our overlay system- you have to get in it and on it with your hands and feet," says Janine Flynn of SuperStone. Photo Courtesy of SuperStone. Tip #6: Bannister adds another item to the packing list-a camera. "We encourage people to bring cameras to document processes and to build their portfolios with pictures," he says. Tip #7: Hamm recommends a little mental "state of mind" preparation. "You should expect to actually work on projects, this means physical and mental aspects," she explains. 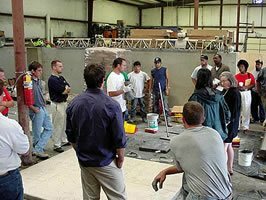 "Don't look to training as an extended vacation, but as a tool that will help increase your ability to be successful in the decorative concrete industry. We want you to be successful, but if you don't participate in the projects and listen to what is being discussed, then it is going to be a waste of your time and money." Tip #8: According to Mangum, a little assertiveness also goes a long way toward getting the most from training. "We're here for you, so ask anything and everything," she says. "Whatever you want to try, that's what we're here for." About being hands on, Harris adds, "The only way to get good working knowledge is to be hands-on, there is no other way to learn." Tip #9: You should also be ready to raise your hand-a lot. "If you don't understand something or didn't hear, don't be afraid to ask," says Flynn. "We love to answer all your questions. We tell our contractors right from the beginning that there are no 'dumb questions'. The more you understand all aspects of the flooring system, the better results you will ultimately achieve, and that is what we all want." Cindy Hamm of Decosup Dallas, Inc. says, "Listen to other peoples questions and answers, because a question [in class] being answered could save you a lot of time and money on a jobsite." Photo Courtesy of Cheng Design. Tip #10: Hamm adds, "Listen to other peoples questions and answers, because a question [in class] being answered could save you a lot of time and money on a jobsite." Tip #11: Harris also suggests getting to know your fellow attendees, as well as minimizing distractions such as cell phone calls. Tip #12: There should be literature available, so be sure to pick it up. Harris adds, "Ask for list of vendors-we supply our students with knowledge about every vendor and supplier they will need to get the job done-then they can choose who to contact." Tip #13: And as for any products you may want to buy, Heitzmann says, "Make sure you have products available in your area, or ask the training facility where the products can be obtained-shipping products can be very costly." Tip #14: Remember that you're also going to be marketing this new technique or product, so Heitzmann also recommends, "Think about how you would market the new information, and make sure you ask the trainer to give you marketing tips." Tip #15: "Once you leave, keep it up," says Harris. "Don't let it fall by the wayside-place an order at the workshop while it's fresh in your mind, then go back and apply the skills immediately." Tip #16: And remember, there's always room for a refresher. "Many of our students come back for another Deminar a year or two later," observes Bannister. "They say it helps refresh what they learned in the previous class, and they want to learn about the latest products and techniques. A willingness to learn and grow helps [you get the most out of training]." To maximize your next training endeavor, print this tip sheet out and check off the items as you go. That way you'll be sure to follow the advice of the experts and get the most for your money!